K-1 is the classic toy. Turning and shaking actions are made with the mouse, touch monitor, keyboard or switch. K-1 is many kaleidoscopes in one. Preset the colours and shapes or allow the program to constantly change them - the choice is yours. The optional music can be used to encourage play, or switched off to avoid disturbing others. Choose one theme from the six provided, or let the music change each time the kaleidoscope is 'shaken'. In Design Mode, choose the shapes and colours that make up the kaleidoscope. Then shake and turn until the pattern suits. Vary the background colour and music at will. 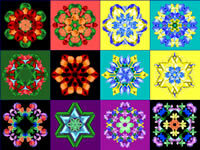 As in a 'real' kaleidoscope, the patterns made are always different. Create a design with K-1 and it will be unique and original. Save designs for later or print them immediately. If you save a design, the whole animation sequence is also saved along with it. These animations can then be displayed in the K-1 screensaver. So - depending on your purpose - you can either save designs because you like the individual snapshot, or because you like the whole animation sequence it belongs to. K-1 can be used in access assessments for those with a combination of physical and sensory impairments. In the multi-sensory room, K-1 acts both as a calming device and as visual stimulation. For those with no control over their movement, use the K-1 screensaver to provide visual stimulation and a constantly changing image. K-1 can be used by older people with no previous experience of computers. A new way to enjoy an old pastime! K-1 is a groundbreaking design tool for switch users. Beautiful designs can be produced within a few hours regardless of physical impairment. Bright contrasting colours and large buttons make K-1 accessible to those with a degree of visual impairment. High powered lenses severely reduce the area of pattern visible on a standard kaleidoscope. With K-1, the entire pattern is visible. For more severe visual impairment, the shapes and background colours can be carefully selected to enhance contrast and visibility. This selection can be prepared in advance, saved and loaded when required. Twenty different selections can be saved to file. Create a Screen Saver with your own animated designs. In the first version of K-1 you could save your designs and print them out. In the new version, you save not only a design, but the whole animation sequence it belongs to. So - depending on your purpose - you can either save a design because you like the individual snapshot, or because you like the whole animation sequence it is associated with. The Screen Saver will randomly pick animations from your save files and display them. Multiple users on XP and Windows 2000 computers. On Windows XP PCs, each XP User can have K-1 configured to their own needs. They each get their own 20 save slots. All the configuration and save files are stored within the User's My Documents directory. Each user can also display their own animations in the K-1 screen saver. A Windows 98/ME/2000/XP PC is required. For best results use a Pentium 400 or faster. DirectX 6.1 or later is required. For older PCs, please ensure your computer is set to resolution 640x480 and High Colour (16 bit). On XP computers, you need only change the Properties of the K-1 desktop icon to ‘Run in 640 x 480 screen resolution’.